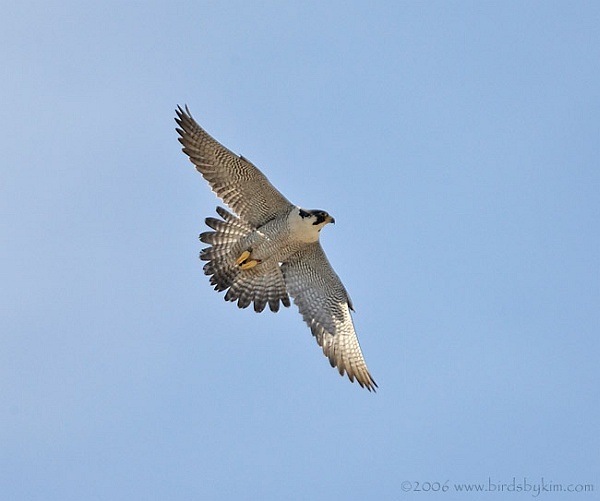 Peregrine falcons are solitary, territorial, top predators. Those that migrate live alone more than 8 months of the year, spending only 16-18 weeks with a mate raising a family. Non-migratory peregrines, such as those in Pittsburgh, stay on territory alone or as a mated pair. No other peregrines are allowed in the territory, not even their own offspring. Peregrines have no long-lasting “love” for their young. Parents care for their nestlings, then teach them to hunt after they’ve fledged. Four to six weeks later the parents wean the young and will no longer bring them food. At that point the young must fend for themselves and leave the territory forever. If they cannot feed themselves, they die. This is The Way of the Peregrine. Wild peregrine falcons regard humans with fear and loathing. We are their enemies. Being captured by a human is not a happy time for a peregrine. As falconers will tell you, peregrines can become accustomed to humans and work with humans but they never love you. They are always wild at heart. This poem, Hawk Roosting by Ted Hughes, is a good description of the solitary nature of birds of prey. GREAT article….thanks, clears up a lot of questions. Thanks, Kate, and thanks especially for the poem. Thanks for some of the answers I had thought of every day I watched Fuzzy/Silver. I am hoping for the best for this young one he deserves everything he can possibly obtain from the human side. Good Lucky big boy/girl. I think that Dorothy is an exception with her nurturing abilities. She has shown this in the past with “Henry” after his window mishap(which prompted his rename from “Screamer”, which was the endearing term for him at the time) and subsequent lengthy recovery at the nest. The extra care she showed him allowed him to recover properly, and his “screams” are still vivid in my mind, as he also hung around through the summer and she stayed near and even showed him her alternate hunting ground of the church steeple in Lawrenceville. We joked at the time that he was the adult child that would never leave, but he moved on after his “extra” TLC as expected. Thanks, Kate. I appreciate the beautiful birds in my backyard even more now. No wonder that we humans wish we could fly, too. Isn’t it wonderful that Nature has programmed such tenderness into mothering birds, even though it is not their nature to be tender. Thank you Kate. I have learned so much this season. Peregrines outside your window see you as the one in a cage.